In John the Baptist teaching, wheat referred to the kingdom of heaven. John the Baptist discussed separating wheat from chaff. According to John wheat will be taken into God’s storehouse while weeds and chaff are destroyed. Wheat was the first grain identified in the Old Testament (Genesis 30.14); and one of seven species that Moses told Israelites that they would find growing in the promised land (Deuteronomy 8.8). Wheat was valued because of its high nutrition content. Although an important food source, growing, threshing, winnowing, and grinding wheat required effort. John referred to Jesus when he said: “His winnowing fork is in his hand, and he will clear his threshing floor and gather and store his wheat into the barn, but the chaff he will burn with unquenchable fire” (Matthew 3.12 ESV). In ancient Judea, wheat was emmer or einkorn; not the wheat grown in Israel today, nor the wheat grown in the United States. At harvest, men cut wheat stalks with a sickle. Farmers with livestock cut stalks close to the ground to use stalks as animal fodder. Farmers without livestock cut stalks close to the seed head to minimize amount of threshing. Children gathered stalks into bundles and took bundles to the threshing floor, a cleared and compacted parcel of ground up to 40 feet in diameter. Sometimes, one threshing floor served an entire village. On threshing floors, farmers used an ox-drawn disc or threshing sledge to cut wheat stalks, but not crush grain (Isaiah 28.27-28). Threshing sledges were made of wooden boards with iron or stone projections on the bottom. The projections cut the stalks and allowed grain to separate and fall to the floor. Horses or oxen pulled sledges over grain stalks spread on the threshing floor. The farmer separated wheat kernels from chaff (dirt, grain hulls) using winnowing. Winnowing consisted of throwing the threshed materials (chaff and grain) into the air with a fork or a basket. Wind separated valuable wheat grains from chaff. Because wheat kernels were heavier than chaff, they fell to the ground or back into the basket. The lighter chaff, dirt, etc., were blown away by wind. At times, farmers used fans to create air currents to separate chaff and other impurities away from valuable wheat kernels. Often, threshing floors were located on a hill top or side to take advantage of wind currents. Finally, the grain was gathered into jars or bins for storage; chaff was burned (Matthew 3.12). John preached personal acknowledgement and repentance of sins followed by baptism—full body emersion—in water as an outward sign of repentance. Mostly, John baptized individuals in the Jordan River. Figuratively, the water of baptism washed sins away. John didn’t stop with a message of repentance and physical act of baptism. John exhorted those baptized to change their behavior and bear fruit consistent with repentance (Luke 3.8-14). Reflection: God doesn’t want any individual to perish. He gives each person time to repent. Regretfully, individuals who don’t repent and trust in Jesus as their Savior are going to be pulled up, bundled, and destroyed. Asaph’s prayer for God to make Israel’s foes like tumbleweeds is in Psalm 83. Although Asaph is credited with writing Psalms 50 and 73-83, possibly he was the ancestor of the actual writer of Psalm 83. The content of Psalm 83 indicates it may have been written in the years immediately before the Exile. Psalm 83 is more an urgent prayer than a song. Psalm 83 takes the same form as several other psalms. First the present situation is defined (verses 1-4). Second, the Lord is reminded how he gave victory to the Israelites in the past (verses 5-12). Finally, a specific request for help is outlined (verses 13-18). Situation defined: God’s people are threatened by enemies. If God does not defend them, they will be destroyed completely (Psalm 83:1-4). The psalmist named 10 nations who allied themselves against God’s chosen. Asaph pleaded for Israel’s safety in a way that made Israel’s circumstances God’s challenge; he referred to Israel’s foes as your (God’s) enemies, those who hate you (God), your (God’s) people, they form an alliance against you (God). Past victories from God: Asaph reminded God he gave Israel victory over the Canaanites (Jabin and Sisera) at the Kishon River. When the Midianites attempted to co-opt Israelites pastures, God gave Israel the ability to drive them out and kill their kings, e.g., Zebah and Zalmunna. Request for help: Asaph pleads with God to destroy – blow away — the kingdoms who want to destroy God’s chosen people. Specifically Asaph wrote, “make them like tumbleweed, O my God, like chaff before the wind” (Psalm 83:13, NIV-SB, 2002). Most often the Bible tumbleweed is identified as the Gundelia tournefortii sometimes called a tumble thistle. Israeli botanists use the Hebrew name, galgal, while Arabs call it the A’Kub. The tumbleweed is native to the Middle East including semi-desert areas of Israel and the Palestinian Authority where it has been documented as an edible plant for the last 2000 years. In Israel, tumbleweeds grow in wastelands and along roadsides from Mount Hermon and Golan in the north to the Negev hills and Eilat in the south. Tumbleweeds do not grow well in the shade. The fruit is a seed. 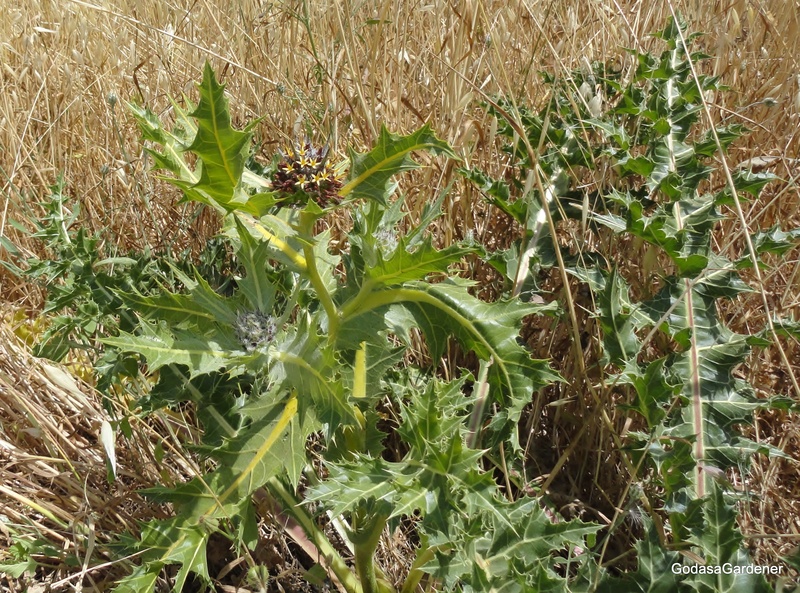 After the fruit is formed, thistle stems separate from roots. Because the tumbleweed is round, it rolls like a ball when driven by the wind. Seeds of dead fruits are dispersed by the rolling plant. Young flower heads are removed and sold in Palestinian Authority markets where they supplement the foods of local people. Mature plants are sometimes used as camel fodder. Action is the process of doing something in order to achieve a purpose. Synonyms of action are accomplishing, battle, and prosecute. God’s action was central in the two places tumbleweeds were named in the Bible. In Psalm 83:13 the psalmist pleading for God to take action and make Israel’s enemies like tumbleweed before the wind. While Isaiah (17:13) recounted God’s action on behalf of Israel. God rebuked the nations and they were driven before the wind like tumbleweed before a gale. Asaph’s motivation for asking God to act on behalf of the Israelites was not only for the security of Israel, but for worldwide acknowledgement of God as the true God (Psalm 83:18, study note). Acknowledgment of God includes seeking God as his people seek him, e.g., to learn about God, his teachings, and his commands. Christians cannot use Psalm 83 against national enemies because Christianity is broader than national boundaries. Christians are the world-wide fellowship of believers and one Christian should not pray for the downfall of another. Christians can pray Psalm 83 against foes who act to destroy them and all traces of their faith (Psalm 83 text note, ESV-SB, 2008). They can ask God to defeat these plans in a way that persecutors seek and know God and accept Christ as Savior. Reflection. Christ said that wisdom is proven right by her actions (Matthew 11:19). What do you think Christ meant? How does Christ’s statement apply to your life?